Over the past year or so I've been trying to uncover the face and personality of our 19th Century Cranky Pressman mascot. Various phases of this ongoing design, drawing and photo-retouching project can be seen in this post. 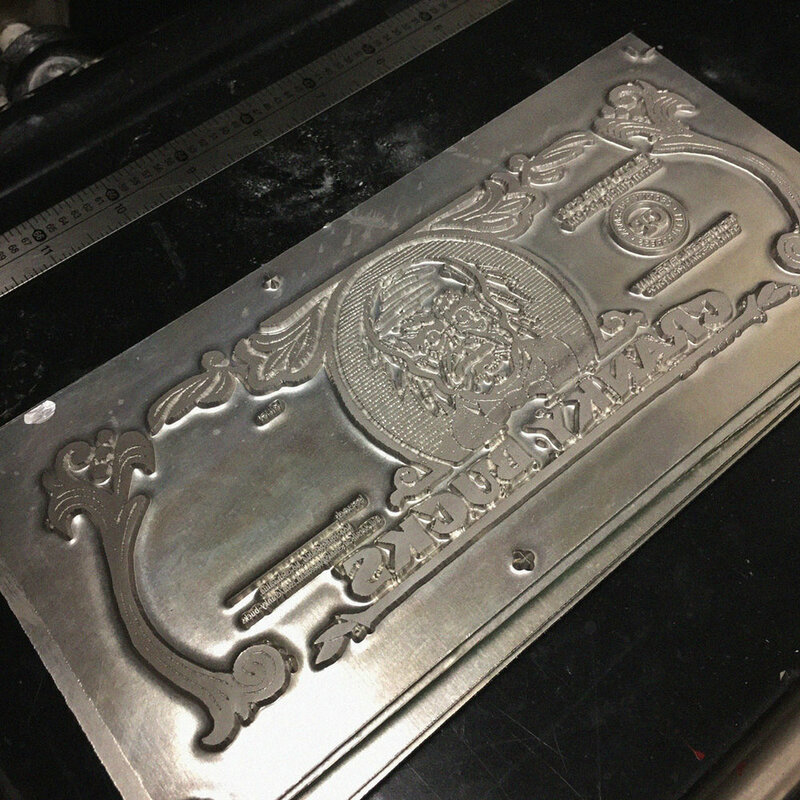 The print shop gets requests for gift certificates, so a piece was needed which could be sent to the gift recipients. We were also looking to create a new direct mail promotion. The solution works for both applications and gets us more mileage from the design and production work. For this Cranky portrait I wanted to move away from the literal portrayals of the old guy and try something more stylized and playful. The concept comes straight from the company's main offering – printing. Actually printing of phony money in this case. It may not be the most authentic-looking reproduction of a bank note ever, but it is rather nicely printed! Here is a close look at the fake money, along with illustration and printmaking process. As mentioned, the work is designed to serve two marketing purposes. For the first campaign we've been packaging up wads of the 'bank notes' and sending them to graphic design firms, advertising agencies and existing customers. There are three notes in each direct mail pack, with denominations of $50, $100 and $250. The money can be applied as a discount on a customer's letterpress printing job. The notes were belly-banded with an old-school cartoonish looking money band. 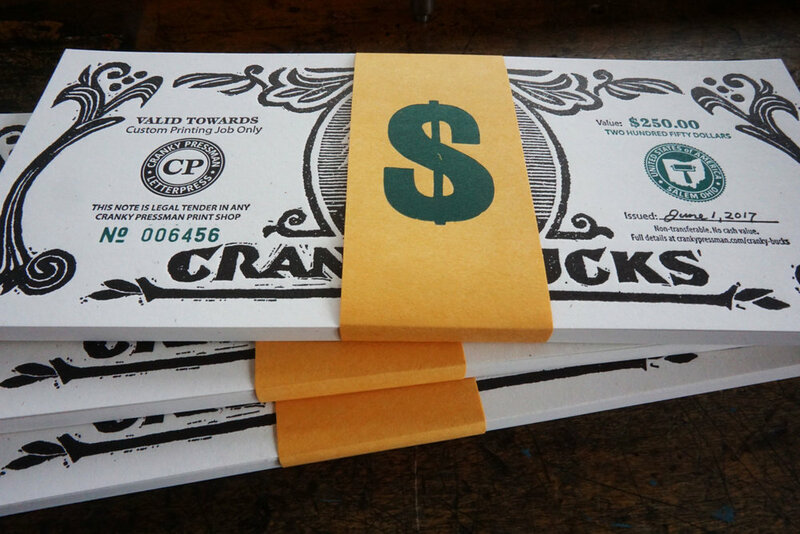 A piece of wood type was used to letterpress-print the dollar sign. Each set included an insert card that details the offer. The outer envelopes were addressed by hand for a personal touch and the bold message 'Big Bucks Enclosed' was imprinted to shout Open Me! I am pretty sure that the design is unrealistic enough to not be mistaken as real counterfeit money. So the G-men shouldn't come looking for us! How to make fake money. The production was a fun process from artwork through letterpress printing. First the note design was carved in linoleum. A proof of the linocut was pulled. This was then scanned and used in the finished digital artwork from which the metal printing plates were made. Jason enjoyed pretending he was a counterfeiting gangster and did a fantastic job as usual! 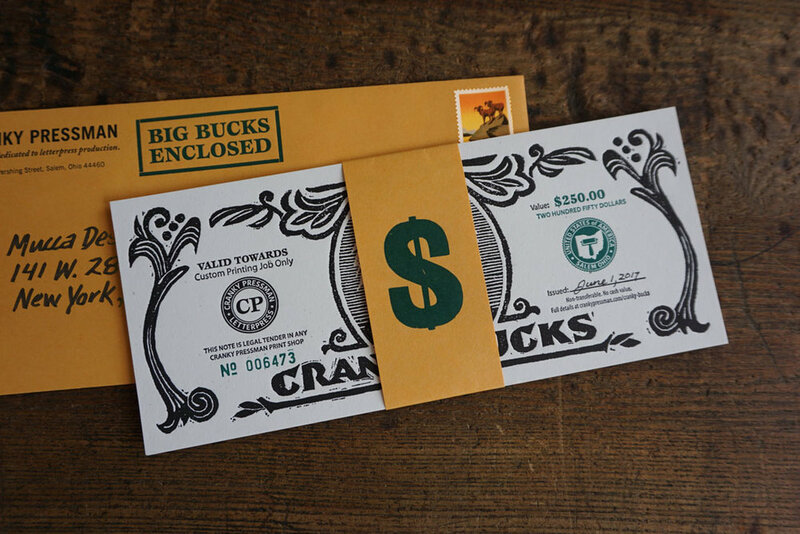 A separate series of the Cranky Bucks were printed at the same time as the promotional pieces. These will be sold and used as gift certificates that can be redeemed for custom letterpress printing. Each note is imprinted with its own unique serial number. The same packaging used for the promotional versions provides a special package to mail the gift certificates in. Piles of Cranky Bucks ready to be trimmed and distributed. Get some of the Cranky Bucks action. The Cranky Bucks gift certificates are now available. 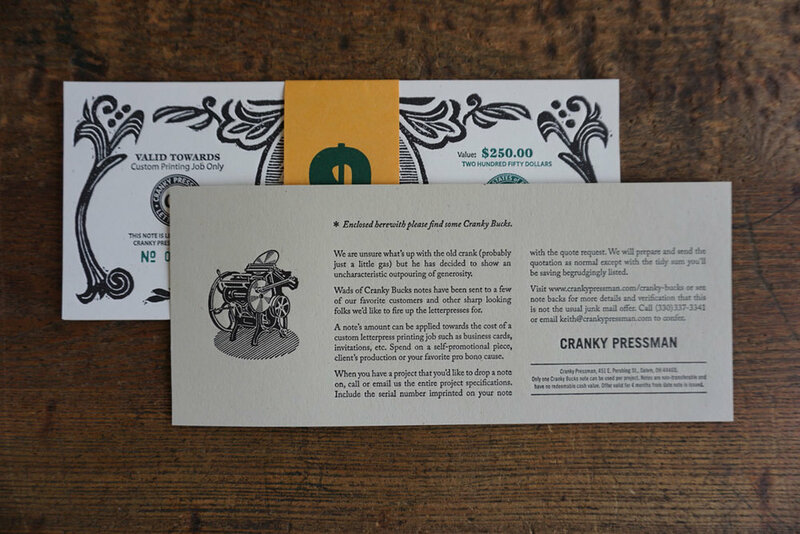 If you know someone who would like the gift of custom letterpress printing to showcase their design work or other business promotion please visit the Cranky Pressman website for more information. Older PostSea battle moves to social media.